I'm the first to admit that I'm a terrible artist so as a warning, so never expect much from me when it comes to nail art. I'll dabble here and there but I can never get any of the techniques right. I'm envious of the girls that do it well and I'm happy to drool over their work. Since this month's Polish Day theme is Something New, I'd figured I'd do something easy in the nail art realm and that's a Saran Wrap manicure. I used two polishes from the Rescue Beauty Lounge GOMM collection, Faraway as my base and Ghost for the Saran Wrap effect. I love how these two colors compliment each other. Both colors were well pigmented and I had no trouble with streaking or application during the process. I used two coats of Faraway followed with a layer of Poshe before applying Ghost and doing the Saran Wrap effect. I learned the hard way though - my right hand I did first and it's a mess because I didn't do each nail individually. Instead, I painted Ghost on all of them and then tried to do the Saran Wrap effect at the same time but despite working quickly the polish dried too much and the effect majorly failed. Overall, not a bad mani for my first nail art post here on the blog! I had fun doing this and I thank Polly and Polish Days for motivating me to try something new. Bonus pics: Rescue Beauty Lounge Faraway before Saran Wrap effect. 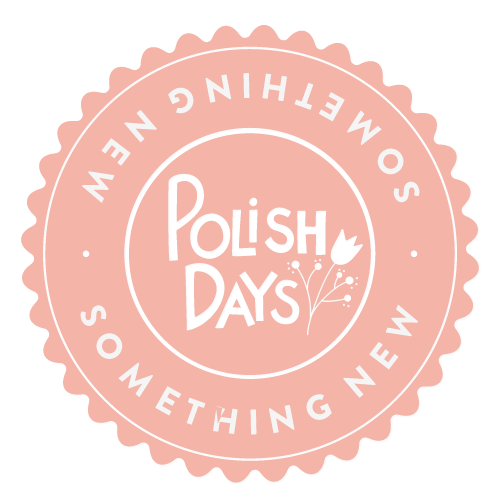 Be sure to check out the rest of the manis below for Polish Days! thank you! yours looks fab too!! So pretty! The color combo is great. thank you!! i should have used some glitters like you did with yours!